***Please check out my full review at www.acreads.wordpress.com! I feel like I need to begin this review by saying that I am not generally a fan of Nicholas Sparks. I have read A Walk To Remember and The Notebook but never ventured much further into his work. I have always felt as though his story lines always follow a specific formula: girl meets boy, girl falls in love with boy, girl and boy are separated, girl and boy get back together, either girl or boy dies. And frankly, I can’t handle reading a love story that always ends in death. So yes, I have been a wee bit cynical when it comes to Nicholas Sparks. With that being said, The Last Song has changed my mind. This book was amazing. I will give Nicholas Sparks another shot. I don’t think that the back cover synopsis gave an adequate summary of what takes place in the book. The love story between Ronnie and Will is definitely a big part of the story, but I would argue that the relationship between Ronnie and her father and Ronnie’s character growth are what lie at the center of the story. When we first meet Ronnie, she is angry and rebellious – partly because she is a typical 17 year old girl going through her angsty phase… but also because she blames her father for breaking up their family. She is determined not to give her Dad the time of day or even the benefit of the doubt, and resolves to find a way to return to NYC before the summer is out. After getting in trouble (I’m going to attempt to limit the spoilers), all plans of escaping North Carolina come to a halt. Ronnie is forced to slow down and accept that she will be spending her summer with her Dad. Ronnie meets Will Blakelee, an attractive local who is the polar of opposite of anything she has ever found appealing in a boy. Despite initial misconceptions and a minor hiccup, the two accept their growing feelings for each other and quickly fall into an easy relationship. Ronnie also begins to realize that her father is a good man and that perhaps she judged him far too harshly. The two mend their relationship and restore the closeness that they once shared. The summer carries on and, as Ronnie falls in love with Will and begins to learn who her father is again, she finds that she has changed. She no longer has the patience for what she once thought was important (i.e., running with the bad crowd, going to clubs, etc.) and she also begins to realize that she is ashamed of the person she used to be. As the summer begins to come to a close, Ronnie and Will make plans for how they’ll continue their relationship into the fall – Will will be attending Vanderbilt and Ronnie will return to NYC. Everything seems like it will all be okay, until………………………………………………. And this is where I say that you have to read the book to find out what happens. Like I’ve said before, I really enjoyed this book. It made me cry (I’ve only ever cried over two other books!). For the most part, I liked the characters – they were each unique and surprised me. I’d expect them to do one thing and they would turn around and do the opposite. I thought that the beginning of the book was a bit slow (I didn’t get past page 27 for two days), but after that the pacing was really good. And, though I’ve never seen the movie, I knew what was going to happen, I was still shocked at how sad I was about the turn of events. I don’t know. Nicholas Sparks, you got me on this one. I do have to mention one thing that surprised me about The Last Song. The spirituality. Ronnie’s father is a Christian who struggles with his faith because he feels as though he has never experienced the presence of God. He is often found sitting alone and reading his Bible, grappling with how he can achieve a closeness with God. As Ronnie grows up, she too begins to develop a faith of her own that she holds very dear. I don’t know why this surprised me. I’ve read A Walk To Remember where the main character discussed her faith and her struggles of maintaining her love of God while accepting that she is 16 and most certainly going to die. The spirituality of The Last Song just kind of popped out at me and took me unawares. But anyway. I gave this book 4/5 stars. I really liked it but it won’t be a favorite. 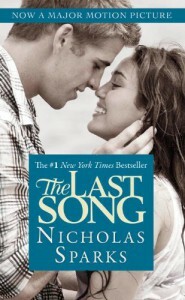 I may read it again, I will definitely track down the movie, and I will be giving Nicholas Sparks another chance. That being said, I would recommend this book to anyone who enjoyed stories like The Notebook or A Walk To Remember. I would also recommend it to anyone who is a bit wary of reading anything by Nicholas Sparks – I think it would be a good introduction to what his stories are usually about.